Vince Neil, lead singer for Motley Crue. Get excited, Motley Crue fans – The band is reuniting. 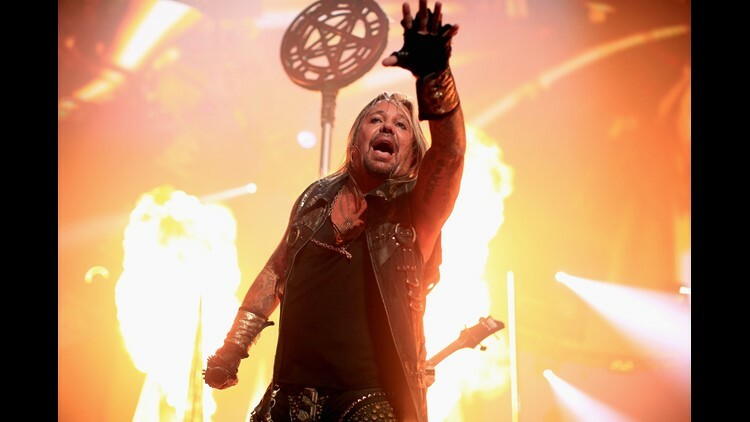 Vince Neil, the 57-year-old lead vocalist of the heavy metal group, shared the news on Twitter Thursday that he's making new music with drummer Tommy Lee, guitarist Mick Mars and bassist Nikki Six. "Exciting news! I’ll be going back in recording studio in a few weeks with the boys to record 4 brand new Motley Crue tracks! Rock On!!" he wrote. In a follow-up tweet, he clarified his previous message, following questions coming from fans. "For those of you who don’t understand, yes 'the boys' means Motley and we signed a contract not to tour anymore," he said. "We never broke up or said we would never make music again. Hope this clears it up." While on their final tour in Jan. 2015, the group officially announced they would play their final show on Dec. 31 in Los Angeles. The band members also signed a contract in January 2014 that prevents any of them from touring as Motley Crue after 2015. During that time, Neil said the band unanimously decided to split while in fighting shape to cap their resume with a knockout. Motley Crue is known best for hard partying, famous girlfriends and 1980s-era hits like "Girls, Girls, Girls" and "Dr. Feelgood."